HeLA cells were fixed with 3% PFA and permeabilized with 0.3% Triton X-100. Nuclei were stained with 1.5 µg/ml DAPI. 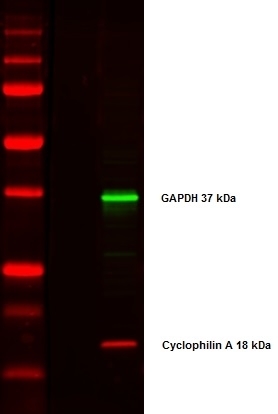 Immunofluorescence was carried out using AHP2167, a Rabbit polyclonal anti-Human Microtubule associated protein 1LC3A/B (MAP1LC3A/B) at 1/25. STAR36D488GA, Sheep anti-Rabbit DyLight®488 was then applied at 1/50. 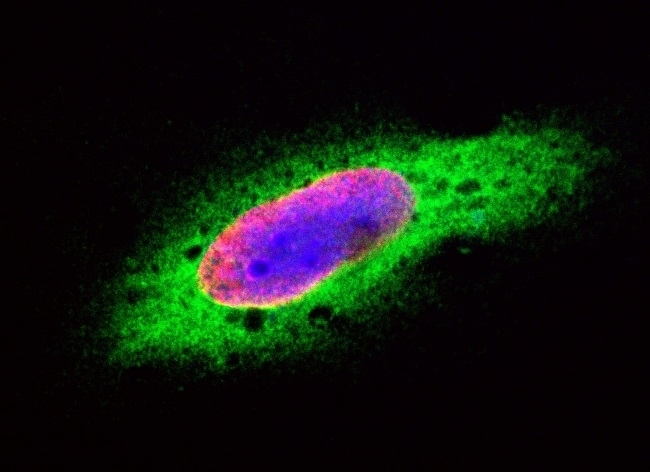 Image was visualized on the Bio-Rad ZOE™ Fluorescent Cell Imager at 60x magnification. 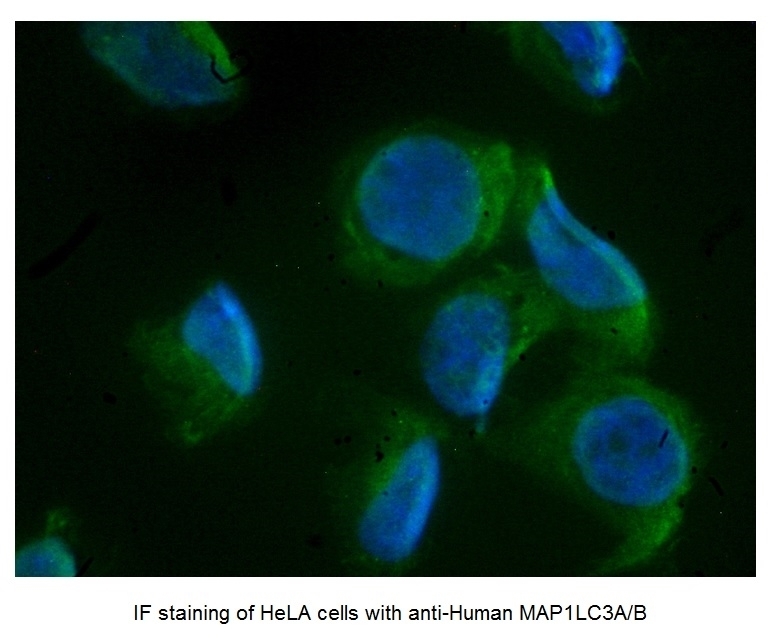 Multiplex staining of HeLa whole cell lysate with Mouse anti PCNA (MCA1558) detected with Goat anti Mouse IgG (H/L):DyLight®488 (STAR117D488GA) shown in green and Rabbit anti GAPDH (AHP1628) detected with Sheep anti Rabbit IgG:DyLight®680 (STAR36D680GA) shown in red. 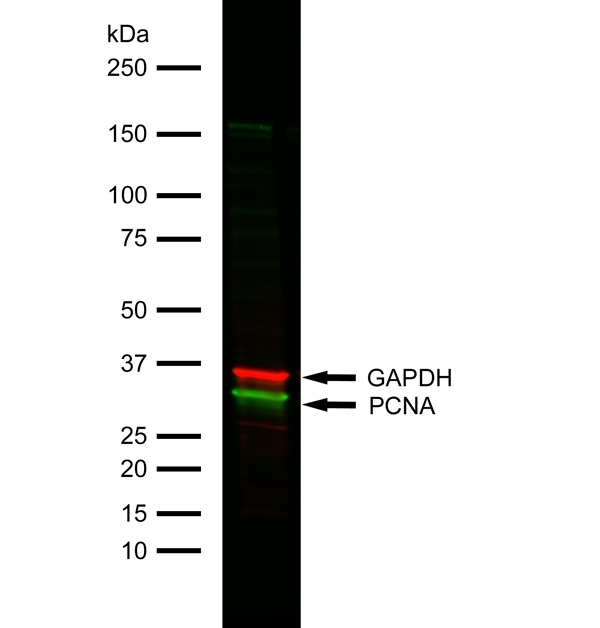 Sheep anti Rabbit IgG antibody recognizes rabbit IgG. In ELISA techniques <5% cross-reactivity is seen with human, mouse, rat or bovine serum. Tartour, K. et al. (2014) IFITM proteins are incorporated onto HIV-1 virion particles and negatively imprint their infectivity.